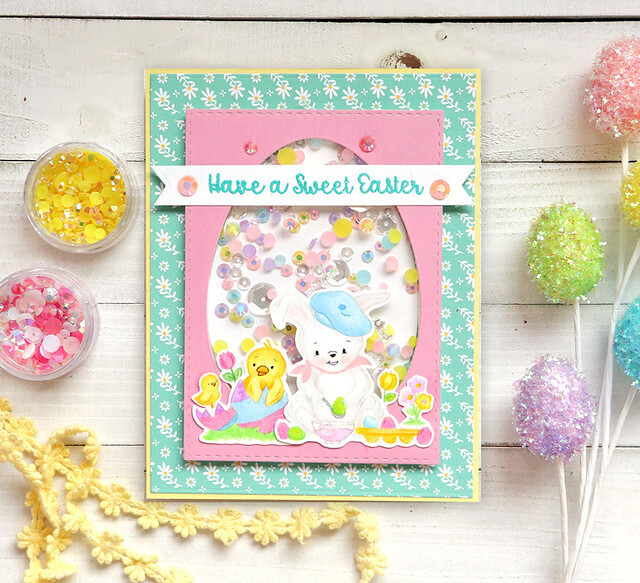 There aren't any sequins in this kit, but I wanted to make a shaker card as the stamp set images are just too cute not to be part of a shaker card. I die-cut the teal floral paper from the kit into a rectangle. I then die-cut one of the other papers with a pink side with a SSS Stitched Rectangle die. 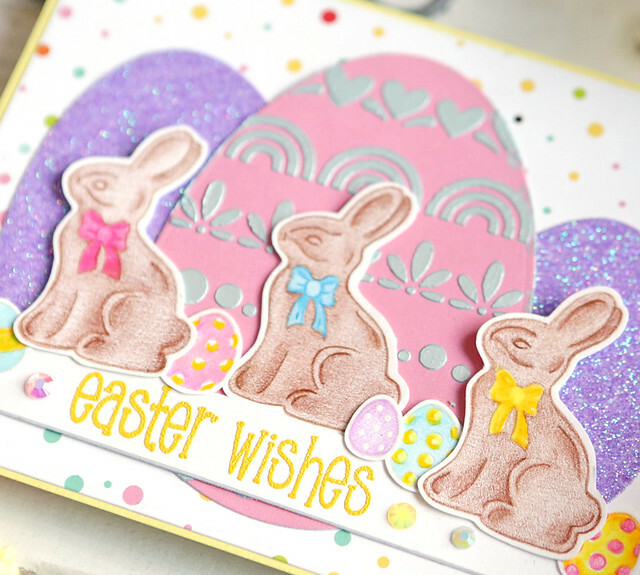 I used the largest Egg die for the opening and also die-cut one from white cardstock. I created the shaker window with the smaller rectangle and used several colors of PPP jewels inside as well as some PPP Sparkling Clear Sequins. For the banner, I used the SSS Sentiment Labels die. I used Wendy Vecchi Garden Patina embossing powder for the sentiment as it matched the floral paper perfectly. I stamped the images with MFT Natural Ink and colored them in with colored pencils. I added some additional PPP jewels over the shaker window and not he banner as well. This is my favorite card of the 5. 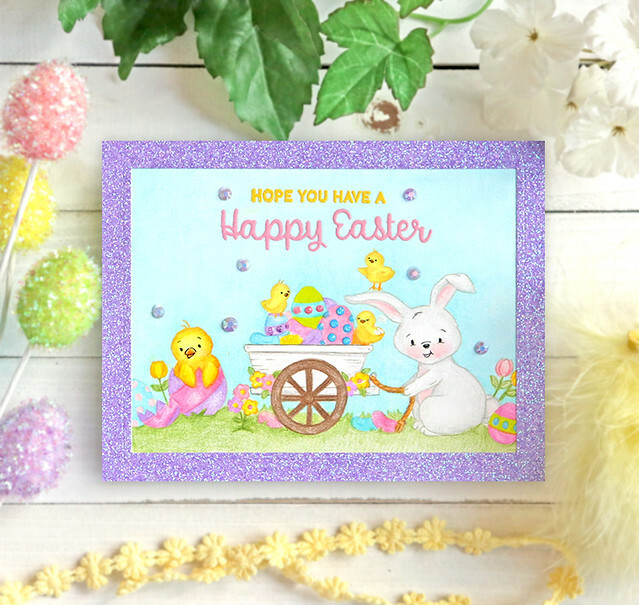 I created this scene by stamping all of the images with MFT Natural Ink on one piece of card size cardstock. I colored them in with colored pencils. For the sky, I first colored it with Copic markers and then added pencil on top of it. This gave me more of a smooth look than pencils by themselves would have. The great thing about using a light ink instead of black is you can overlap stamped images and it doesn't matter as your coloring will cover the areas overlapping. Much easier than blocking areas as you stamp. I created a frame with the purple glitter paper in the kit. I was a little hesitant to add the frame as I really liked the simplicity of just the colored images and a one layer card. But I couldn't resist that gorgeous paper! I stamped the sentiment using two Wendy Vecchi embossing powders - Pink Peony and Sunflower. I used some Tonic Nuvo glitter drops on the eggs. I added some PPP Pansy Purple jewels around the images. 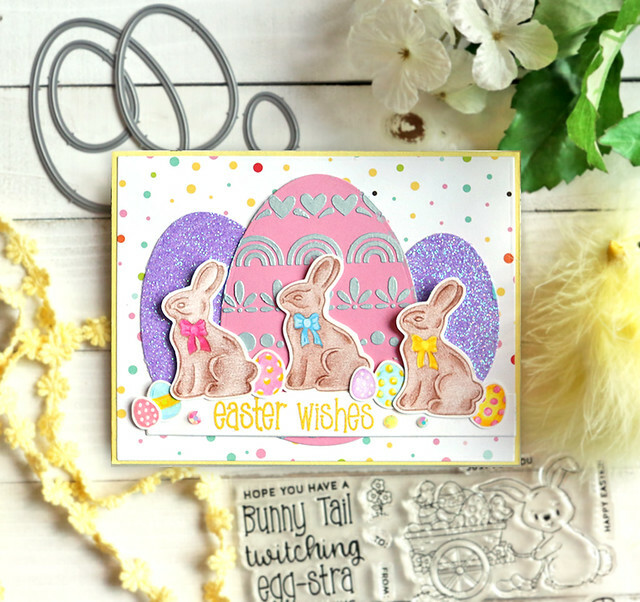 The stencil in this kit is super cute and was already on my want list at SSS. It is called the Decorative Segments stencil and is sold alone at SSS. I used a tape that doesn't rip the paper to cover below and above each of the elements and then rubbed Distress Oxide Inks on just that line. I think it turned out really cute and could be used for a lot of other things too. 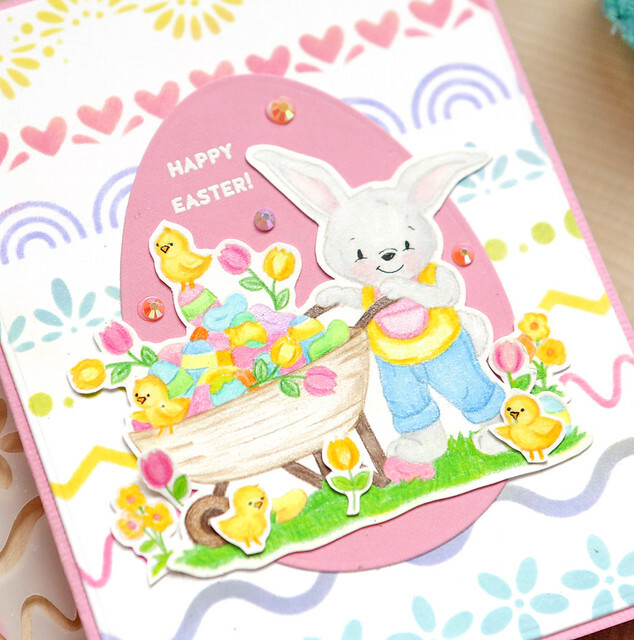 I die-cut the largest egg die out of the same pink paper in the kit I used above. I stamped the sentiment with white embossing powder. 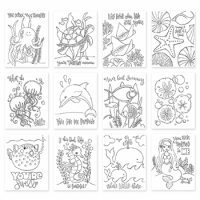 I stamped the stamps on white cardstock with MFT Natural Ink and colored with colored pencils. Pretty much what I do for everything lately! I cut around the images and added a few of the smaller flowers and chicks around the larger image. I attached them over the egg die. I added some PPP jewels over the egg. And continuing the honesty line of thought - this card is my least favorite! I wasn't sure I made it right. Too many eggs or something! Anyway, carry on... I started with a rectangle die-cut from one of the papers in the kit. 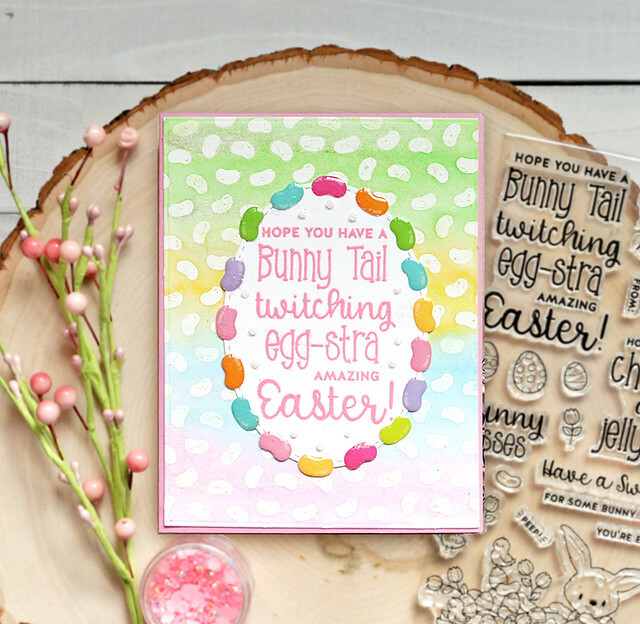 I then die-cut and egg from the pink paper. I attached the stencil over the egg and used the Tonic Mousse in the kit over it. I let the egg dry and then also die-cut two from the lavender glitter paper. I layered those three eggs on the paper first. Nest, I stamped the sentiment using Wendy Vechhi Sunflower embossing powder on a banner cut with the SSS Sentiment Labels die (I get so much use out of that die set!). I attached the banner over the large eggs. 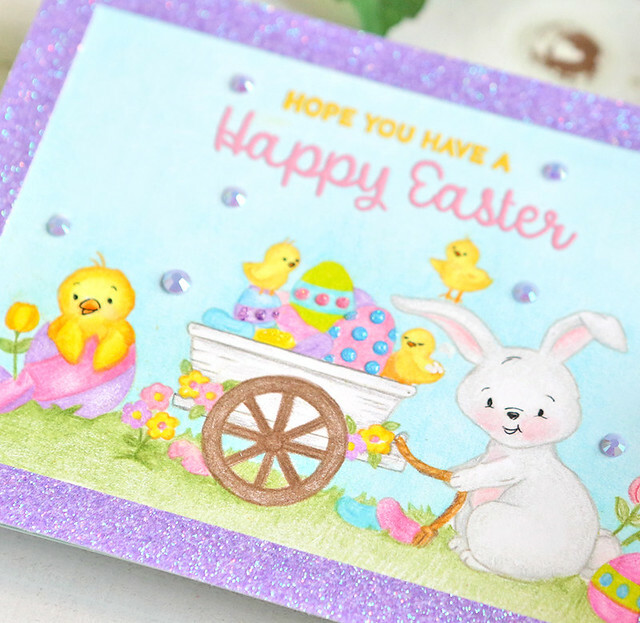 I then stamped the eggs and chocolate bunnies on white cardstock with MFT Natural Ink and colored them with colored pencils. I then fussy cut them all out and attached them over the banner and larger eggs. I added some PPP jewels over the ends of the banner. 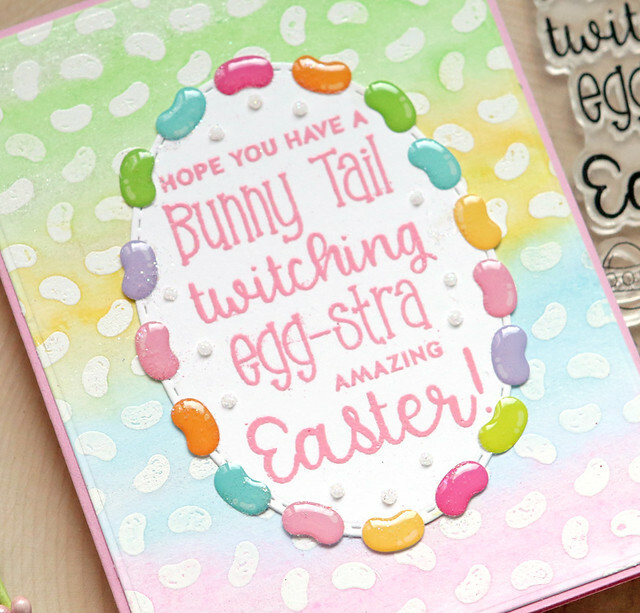 I stamped the jelly bean background stamp on watercolor paper with white embossing powder. I then used watercolor over it in several colors. I die-cut a SSS stitched oval die out of white cardstock. I stamped the sentiment from the main stamp set using Wendy Vechi Pink Peony embossing powder. I love this one as it is large enough to be the focal point of the card. I attached that to the card front. I decorated the oval with the jelly bean epoxy stickers around the oval. I even had three left after using them all on this. I used some Glossy Accent dots over the white and poured white glitter on them. 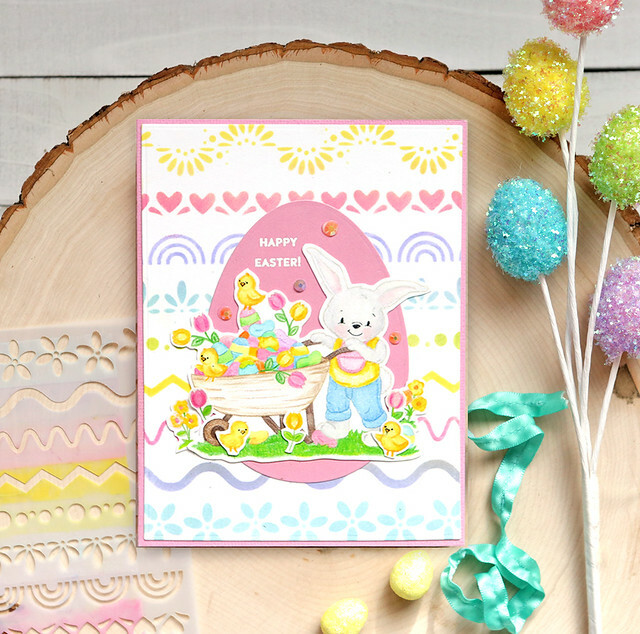 I love the Eggstra stamp set, and your cards are adorable.